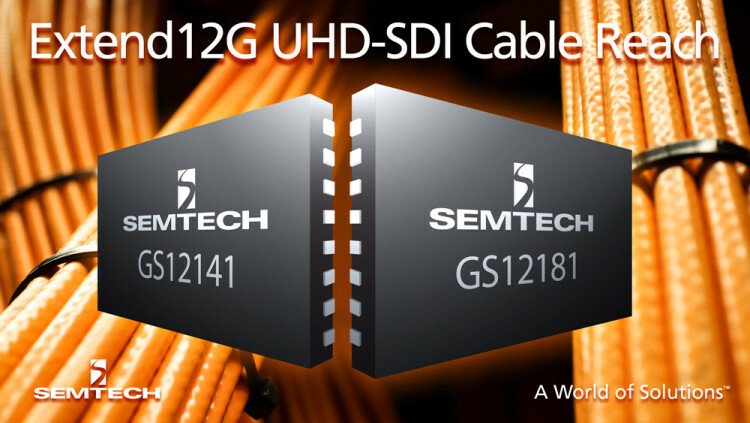 Semtech Corporation (Nasdaq: SMTC), a leading supplier of analog and mixed-signal semiconductors, announced that its advanced portfolio of 12G UHD-SDI products has set a new industry cable-reach performance benchmark utilizing a new coaxial cable optimized for UHDTV applications from Canare, a leading industry supplier of UHDTV cabling solutions. Semtech’s 12G GS12141 retiming cable equalizer and GS12181 retiming cable driver each offer superior performance at all data rates and have established an industry benchmark for cable reach that is further enhanced when utilizing Canare’s L-5.5CUHD cable. Semtech’s comprehensive portfolio of 12G UHD-SDI products is being demonstrated in Semtech’s booth N5024 at the National Association of Broadcasters (NAB) show on April 18-21 at the Las Vegas Convention Center. Design: Careful selection and a blend of materials was utilized to ensure high quality and long transmission distances. Cable Size: The outside diameter of the cable is the same as existing L-5CFB and L-5CHD cable to ensure interoperability. Performance: Transmission distances of greater than 100m are possible with 12G SDI signals. Dedicated connector: To further enhance return loss performance with SMPTE ST 2082-1, a new BNC connector is also available. The GS12141 and GS12181 are available now, and the GS12070 will be available in the second half of 2016. Semtech offers comprehensive design assistance, including field- and factory-based support. Data sheets, volume pricing and delivery quotes, as well as evaluation kits and samples, are available at www.semtech.com/info. Offering value-added products to meet your needs for today and tomorrow. Responsive: Fulfilling the needs of the industry through custom solutions. Unique: Incorporating valuable features not offered by competitors. Cutting-edge: Devoted to meeting the requirements for emerging technologies. Enduring: Concentrated on products with long-term value. Global: Focused on niche markets as well as universal products. Activities: Manufacture and sale of audio-video cables, connectors, assemblies, converters and related products for professional audio and video industry. For more information, visit www.canare.com. All statements contained herein that are not statements of historical fact, including statements that use the words “enables,” “offers” and “will” or other similar words or expressions, that describe Semtech Corporation’s or its management’s future plans, objectives or goals are “forward-looking statements” and are made pursuant to the Safe-Harbor provisions of the Private Securities Litigation Reform Act of 1995, as amended. Such forward-looking statements involve known and unknown risks, uncertainties and other factors that could cause the actual results of Semtech Corporation to be materially different from the historical results and/or from any future results or outcomes expressed or implied by such forward-looking statements. Such factors are further addressed in Semtech Corporation’s annual and quarterly reports, and in other documents or reports, filed with the Securities and Exchange Commission (www.sec.gov) including, without limitation, information under the captions “Management's Discussion and Analysis of Financial Condition and Results of Operations” and “Risk Factors”. Semtech Corporation assumes no obligation to update any forward-looking statements in order to reflect events or circumstances that may arise after the date of this release, except as required by law.